Note: This interview was originally conducted in mid-2003, just prior to Gemstone's relaunch of Disney comics in the US. Despite the best laid plans of myself and the editors of two different magazines, this article remained unpublished ... until now. If there's one thing that a lot of folks don't really understand about the owner of Gemstone Publishing and Diamond Comics Distributors, it's the simple fact that Steve Geppi is a die hard comics fan. And, truth be told, he's probably more fanatical about his love of Disney comic books than just about any other genre or character. It's a life-long affair which stems from his childhood that's helped shape his entire life, and comics have proven to be a passion that has reaped rich rewards for Geppi. All of which goes a long way to explaining why Geppi, as a fan, might want to take up the challenge of re-establishing the presence of Disney comics on the shelves of their American homeland after a three year absence ... but doesn't do much of anything to explain why such a savvy businessman would want to champion what many pundits, professionals and retailers see as a dead brand. 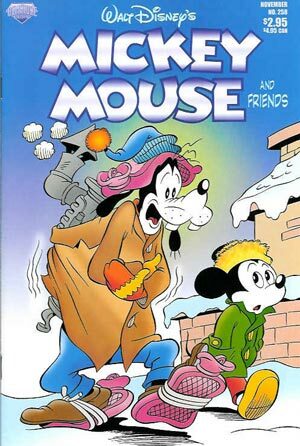 Geppi, however, doesn't see Disney comics as moribund in the States in any sense. In fact, he sees the property as a virtually untapped resource with strong appeal to just about everyone in the world ... and especially appealing to the unsuspecting general population of the land that spawned the Disney empire, the good ol' U.S. of A. Bill Baker: Aside from the fact that you've been a life long fan of them, why resurrect Disney comics in the US, and why do so at this time? Steve Geppi: Well, good questions. I'll start with the "Why now?" inquiry, because I have been working on this license for, really, three years on and off again, ever since the license with Gladstone expired. Disney actually contacted me and asked if I was interested, and, of course, I was because, as you say, it was my childhood dream to do something like this, and having the opportunity to publish the Disney comics that I've known and loved all these years was really special. But, during those three years, there's been a lot of things happening in the comics industry. You have to remember that, in the direct sales market which Diamond primarily services, the humor comics aren't the biggest sellers in the world and, as such, venturing into a publishing concept that involves those types of characters is pretty risky, financially. And, of course, having been the distributor for Gladstone, I know the numbers as well as anybody, so I kind of know what I'm up against. That said, I always felt that, with due respect to Gladstone and everyone else, maybe I could have made a difference and increased the sales some other way. But I guess I was realistic and knew that I couldn't dramatically change the sales in the direct sales market, albeit that I am still hopeful that can occur. What's made it different, and important, now that I take this venture is because Diamond, along with a variety of publishers in our roster, is now entering the bookstore market, or the mass market, under the auspices of our newly-formed entity called Diamond Book Distributors. This will give me, and is giving me, for the first time, the opportunity to sell to the Barnes and Nobles of the world, the Wal-Marts, the Costco's, the Targets, etc. This is where I feel this type of product has a strong chance of succeeding, and also serves to address the purpose that originally got me -- in answer to your question "Why Disney?" -- originally got me thinking about this, is that we are suffering from a drastic shortage of children's comics in the comic book market. Meaning that when kids are five to ten years old, if they don't discover comics then, it's a good chance they won't discover them later. I know when I was a kid, my mother would bring me home comic books. Archies, Disneys, Richie Riches and the like, and what that did for me, is it made me aware of comic books existing at an early age in my life, so that, when I was able to make my own buying decisions later on, I knew what a comic book was. If a child growing up today isn't aware of what a comic book is, and then turns nine or ten, they're already finding other forms of entertainment -- DVDs, video games, what have you. So it was important for me to pick Disney because that is the most powerful brand I think you can get with children's comics, right now. Also, the timing was also absolutely perfect as it relates to our entry into the bookstore market, not the least of which to mention is the fact that having been at a three-and-a-half year absence in the US marketplace, there's a pent-up demand for these products, as well as a build-up of good material that's never been seen in this market before, but has been published during those three and four years by Egmont over in Europe. BB: How much does the weak kids book market concern you in the long term? SG: It concerns me that the bulk of my business is selling superheroes and other comic books that are geared for an older audience, I have to worry about the attrition factor. If the newer generation isn't cultivated at an early age, how will they transfer any interest that they may have into superheroes. They have to discover them when they're twelve or thirteen, and it may already be too late. They may already be involved in something else. So I see it as an evolution, as it always was in comics. You discover comics when you were a kid, perhaps reading funny animal comics, humor comics. You graduated to Archies and teenage comics and, ultimately, into superheroes or more cutting edge comics. Or all of the above. But, certainly, we are threatening to cut our legs off if there are no humor comics for kids to find out about when they're little. That's not to say that these are all about children. As we know, Carl Barks and Don Rosa and all these other great artists that have done these books geared these stories towards an older audience. But the Disney characters are so universally recognized that it gives you a fighting chance when a mother walks into a Barnes and Noble, or a comic book store, or a Wal-Mart, and sees a holiday themed Disney comic perhaps, and says, "Oh, that'd be cute to bring home to my kids!" Basically, in your first question, which I'm trying to answer for you as best I can, you asked "Why Disney?" And my answer to that is, "Why not?" Because if you're going to go after the children's market, and you want to grow the business, in general, for the benefit of all the other publishers that you deal with, you need to first find a product that really appeals to children. And I know when I was a kid it appealed to me, and I can't find a reason in this world why kids today would not be interested in Disney comics -- if they're exposed to them at an early age. Those same stories that were written and entertained millions around the world in the forties and fifties are every bit as appealing to a new generation, in my humble opinion, as they ever were. But the real problem is availability and distribution. That is something that I feel I can fill by virtue of the fact that I own Diamond Comics Distributors. BB: What kind of steps are you planning to take to help promote the success of these books? For instance, are you going to be advertising their availability to buyers outside of the direct market? SG: Yes. You'll find that we're going to do a lot of outreach programs, not all of which are nailed down at this point, or do I even wish to disclose on some level, but I feel like there is an opportunity here to get comic books into a library, to get them into, as I said, the mass market retailers, to schools, whatever. Places that historically have had a resistance to comic books because they tend to look at them as too violent or whatever. With that prejudice, it makes it difficult to get the mass market type of exposure that they once enjoyed. Remember, there was a time when wherever you went there was a newsstand -- at least where I went, but I'm going to be 53 soon -- you could find comics anywhere. The good news is today there are better places to find comic books, vis-a-vis the direct sale comic stores, but there are less outlets to find them at. So if you know where a comic store is, that's great. But if you're the person who's walking into a mall that maybe doesn't know they're going to buy a comic book that day, you're not going to trip over one -- unless it happens to be one of those few malls that has a comic store. So we're trying to get these into the mass market as best we can so that they will have this universal recognition everywhere. 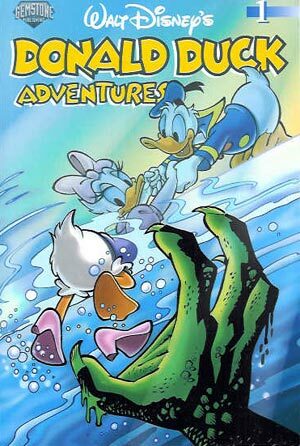 You know, it'll surprise people to know that the Disney comics haven't been published in the last three and a half years in the United States. We all, in the direct market, know that, but the mass market at large would not expect that to be the case. BB: Right. 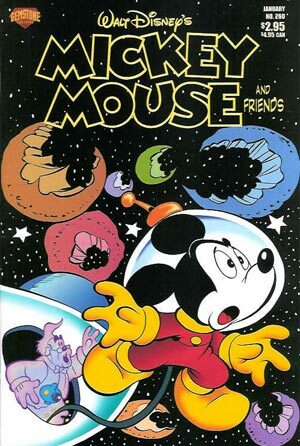 Often when I'm talking with folks from outside of the industry and its fan base, they're shocked to find out that Disney comics haven't been available here in America for the past few years. They can't believe it. SG: I think that plays well for us right now on the timing issue, in that we can play to "The beloved Disney characters are back!" slogan, if you will, and give people that fresh approach and the chance to start jumping in at the right time, with the 21st Century generation of Disney comic readers. We hope to have a large subscription following that we intend to build as best we can. There was a time when Walt Disney's Comics and Stories was enjoying an incredible, almost house-to-house subscription rate in Sweden and the other Scandinavian countries. And even here in the United States, in the heyday of the forties and fifties, they sold upwards of three million copies a month. That's the beauty of getting into a product like this; you know it once demonstrated the capacity to do that. It isn't just a pipe dream, "Boy, wouldn't it be great if we could sell a million copies a month?" We're dealing with a product that has done it before. We've got to find a way to get it to do it again, and I think that a great deal of it has to do with the distribution of the product. I don't think the stories are any less enjoyable,or sellable, or promotable than they were in the forties. The problem is that people just don't know they exist. BB: Well, keeping that in mind, and the fact that we've covered book stores and comic book shops, have you completely given up on newsstand sales? I may be the next crazy guy that thinks that he can figure out the newsstand when every person before me has tried to do it and found out that you get buried in returns. But there maybe be some creative ways to make it work. It may be a part of the program, just maybe not an initial part of the program. But I am hopeful that, at some point, we can have a low price point product on the newsstand in addition to the low price point product we anticipate creating for the mass market retailers, as well as the prestige format that we'll start out with to get the ball rolling in the direct market. BB: What about paperback racks in supermarkets and drug chains and the like? 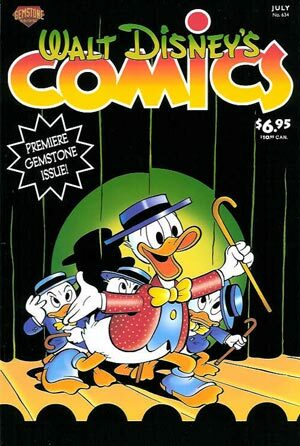 Any chance of seeing a Disney comics digest showing up on those racks in the future? SG: Well, that is kind of dependent on what you call it. The racks are one thing, and where they're located is another. So you can have the same racks in a food store, you can have them in a Wardens, or you can have them in a Wal-Mart. We kind of approach it from the category standpoint of which type stores have what racks. So my opinion is that if you look at the marketplace, for example, in Europe, where Egmont has been extremely successful, you'll find this pocket book sized book, 5 by seven and a half inches, type of product has a good feel to it. It's a size that allows us to deliver an economic package of 128 pages at $7.95, where you will not only have good distribution, but you'll have a price point that's attractive, to get that child or parent to pick it up and feel like they're not having to bet the farm to buy one. BB: And that's in full color, right? BB: That's actually about what most paperback books go for these days. SG: It is. Keep in mind that we are the beneficiaries of a three-and-a-half year backlog, if you will, of product that's been generated by Egmont all during that period when Disney comics weren't being printed in the US. All that is available to us through the Disney program, plus the tremendous backlog that exists going back to day one of the Disney line. BB: Well, that brings up the question of what kind of mix of stories we might expect to see in the different editions you'll be putting out. I ask, because I know that you don't necessarily plan on putting the same stories in all the different editions at the same time. So, will a collector have to buy both the direct market books and the mass market collections to get everything? 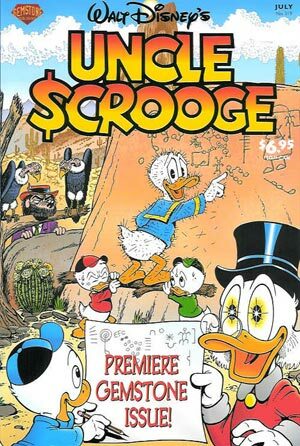 SG: The program is this: We've started off with the two monthly titles, Walt Disney's Stories and Comics and Walt Disney's Uncle Scrooge, picking up where they left off when Gladstone ceased publication. They will be in the prestige format. They're in the prestige format and combine Barks reprints and/or new stories by Van Horn, and Rosa, and other people like that. Albeit that they might have been seen elsewhere, they're new to this market. When we launch our pocket book program, with that smaller sized product that we just discussed at a more attractive price point. As for our just-launched pocket book program, there are going to be a variety of products going into there. No doubt there will be times when there will be material that is in those that is not yet available in the direct market. We don't want to be in the situation where we're constantly giving both markets the same thing all the time, and it's a just a matter of who's getting it first. Now, having said that, there are some of these artists, as it has been explained to me by the people at Egmont, who draw in a certain storyboard size that is conducive to that pocket books format, that is not as easily adaptable to the prestige format, for example. So maybe Van Horn -- I'm just throwing these out, I don't know which is which -- is more conducive to a pocket book size than a Rosa, or vice versa. So there will be a point, I would say, in answer to your question more specifically, where you'll have to buy from both markets to get the total spectrum. But they'll be available to both markets. Keep in mind that Diamond Comic Distributors, whatever it offers to the book store market, or the mass market, will simultaneously be offered to the direct sale market, so no one will have to look far to get it. BB: Right, and ideally avoid the problem of trying to find all the stuff, as well. SG: No. My goal is to make these stories available to everybody at whatever price point and convenience that needs to be. Because we have the die hard collectors who supported Barks for years and years and years, and we want to always embrace them, and take care of them, first and foremost. But we want to expand the audience so that more people can discover and enjoy the comics that we all discovered and enjoyed, as well as try to justify the whole program, because we need the volume that the mass market represents in order to get these things into the price points that make sense for everybody. BB: Now the idea of expanding the market, bringing in new readers, does that also open you up to the idea, which you've bandied about, of bringing in artists that folks might not expect to be working on the ducks? SG: That is entirely possible. One of the reasons I say that is because, in looking at the material already sent to me by Disney from the many examples of what licensees have already published, there is a large amount of artists that yours truly has never been familiar with, that are extremely talented that haven't gotten the notoriety or recognition in our market because they have never been published here. You will be extremely impressed. But of course we're well aware of the favorites. And keep in mind, the good news about keeping a good schedule on this is that we already have three and a half years worth of Rosa, and Van Horn, and Jippes, and Block, and the like to draw from so that this market will be very well taken care of with material that they have never seen before that even has to become a concern. But in the interim, of course, we'll be negotiating and talking with various artists and writers, as we already are, as they develop new products. And, quite frankly, I wouldn't be surprised if we had some people who have never done the ducks before, that are popular artists in our market, I wouldn't be surprised if we could talk a few of them -- and I've already talked with a couple of them, that's why I'm comfortable saying this -- to do Disney comics, and let them try their hand. But all the while, the focus is on quality, and value. BB: Now, not trying to nail you down prematurely, but by "popular artists" are you referring to people primarily known as superhero artists, or ...? SG: Well, I don't have a preconceived notion, but I have had people who have drawn superheroes, knowing my love for Disney and maybe feeling a little more comfortable about approaching me with the concept, actually say to me, "You know, I wouldn't mind trying my hand at drawing a Disney comic," -- some that I thought would be pretty surprising for people. I'm not saying I'm going to have an Alex Ross Uncle Scrooge tomorrow, although that would be intriguing to see! [General laughter] But I would say that there are some artists -- and I don't want to say any names right now, because that wouldn't be fair to them, or the program -- that might be right for the project. Remember, a lot of us growing up in this industry have our prejudices and our loves, and if you happen to be one of those fortunate ones who did develop the talent, or had the talent to draw, and you've got a willing partner here that says, "Hey, yeah, we're open to that idea," where before it might have been considered off the charts and untouchable, you may very well find that somebody that is very talented is very talented, and that doesn't mean he can draw only superheroes. BB: Actually, I'd love to see a duck version of the Mona Lisa. SG: I think Barks did something like that once. There have been attempts. But, putting my other hat on for a minute, I think that one of the driving ideas in my brain is this: As the distributor that we are in the direct market as Diamond, I am concerned about the next generation of readership. And, in my position, if I happened to be the one elected to fill that bill, to go out and try to publish these Disney comics that maybe other people aren't necessarily excited to do, because the financial considerations on the front side are not attractive enough to do it, then so be it; I'll do it. Because I really believe, at the end of the day, if we get the mass market exposure into the retailers that we talked about, these people who discover Disney comics and become readers and collectors of them will ultimately find their way into the comic stores. Because it's a no-brainer. Once you get interested in comic books, unless you're asleep at the switch somewhere, you're going to find out where a comic book store is. You may not forever find yourself shopping forever at a mass market retailer, with all due respect to them, because the selection won't be the same. So, really, it's a grass roots attempt also to drive new readership into the direct market comic stores. BB: That's something that the industry really does need right now -- bodies going into the stores. SG: When I put these on the order form for April, for June  shipping, retailers are probably going to be [Retailers appear to be] ordering along the similar lines to what they did in the past. There'll be others who [Others] have told me they're going to take an aggressive posture, because they feel this is important, and needed, and they want to get behind it and support it, for which I'm eternally grateful, and which I will ultimately do everything in my power to persuade them to do. But that said, it'll take a while on a trial and error basis for them to get comfortable with ordering Uncle Scrooge and Walt Disney's Comics and Stories as they would a familiar superhero title. Because some of these stores aren't in high foot traffic areas, and their concern will be that they don't have the kind of traffic that comes in that's needed to support these books. But we're going to do as much outreach publicity as we can to try to drive people to the stores, whether it will be through the Internet, or advertising in magazines, to let people know that they should be checking out the local comic store, or the local bookstore. There will be a way to find where to get your favorite Disney comic books. We're going to show you. Which is why, if for no other reason, we have the comic shop locator service that you're probably familiar with, that will be a way to make sure that the new-found readership has a place they can call to find out where the latest comic books are. We've also set up a website where, if they're interested in getting updates about what's going to be happening with the Disney books, fans can just log on, register themselves and they'll be getting a regular email newsletter from us. We've already had a lot of people signing up pretty quickly. It's refreshing the number of emails and notes I've gotten from old friends, and retailers, and consumers excited about the comeback of Disney. I'm not just giving you a hype story here because we're publishing it, but it's really true. It's the old expression "You never miss the water until the well runs dry" in action. I think people have noticed, conspicuously now, that there's an absence -- not only of Disney comics -- but of children's comics. I mean, we've got Bongo publishing The Simpsons, and we've got the Archie people doing their thing, which is all well and good. And I think this is going to help them, quite frankly, because it's hard to get noticed in a category which is so small. Ironically, it was the biggest category at one time, back in the forties. But maybe things balance out over time, because it's a cyclical world, the publishing business. BB: Any idea of when we might see some new, Gemstone-generated Disney stories? SG: From the standpoint of the American public, unless you guys have access to the foreign editions and are capable of reading foreign languages, all these Rosa and Van Horn and such stories will be new. They just happen to have been published in Europe before, but they certainly have not been seen by anybody over here. So, technically, I don't know what the difference might be to somebody who's not seen them, versus one they drew last week and not seen. "New to the English language," I think, is the way we've been putting it. Having said that, we're not going to sit here and run out all the stories that have been done and then go, "Oh, gee. What do we do now?" During this luxury period of time that I think we have to develop and put out as lot of what appears to be brand new stories, we can be working with the various artists, the very selfsame ones that would be publishing there, anyway, to build up the next backlog, if you will, so that we're always running like a top. We've got plenty of stuff in the pipeline. Which is one of the problems that comic publishers have had historically, because of deadlines. An artist can only work so fast. But if you have the luxury of being five or six issues ahead -- or ten or twelve -- it's easier to stay on schedule, as long as you don't get lazy about it,and bank on that. BB: Ah, so there is a good chance we'll eventually get to see the next Rosa epic first, then. BB: This is something that some fans, and more than a few retailers, I'm sure, will want to know: Are you planning on keeping stuff in stock and in print, or will you be leaning towards the "publish to orders" Marvel-style of inventory management? SG: We intend to be careful about what we do, in that we don't want to put ourselves out of business by grossly overprinting. But, that said, we don't expect to be cutting it to the bone, either. And especially as it relates to when we launch the pocket sized books, no doubt we're looking at those with the intention of them being permanently in stock. Maybe it needs to be reprinted from time to time, but the intent here is when people go into a book store or a Wal-Mart, they're going to find, as time goes on, an ever-growing inventory of traditional perennial sellers from the Disney family of comics. BB: I suspect the answer to this one's, "I'd like it to be forever," but in technical terms, what's the current term of your license with Disney? SG: This license, counting the start-up period, is three and a half years. But for practical purposes of publication, it's three. And I'll draw your attention to the fact that, technically, I'm only the third different publisher in the history of Disney comics licensing in the English language format in the United States. Western Publishing held that license for 50 years, until there was change brought about at Western that caused them to not to be in that business anymore. Otherwise, they'd probably still have it. Then Gladstone. Disney for a period did it themselves, if you want to count that as a fourth publisher. Then it was back to Gladstone, the same people again. So really it was Western, Gladstone -- or Another Rainbow, if you will -- and now Gemstone are the only three if you don't count Disney themselves. So I think Disney has an intention, hopefully, if we do a good job, and that's really the ultimate criteria, to have us publish in perpetuity. BB: Speaking of Gladstone, you hired the entire editorial team that ran those offices to head up Gemstone's incarnation, right? SG: Yes we have, and that's something I'm especially proud of. As a comic collector, I know people love continuity and they love consistency. What better way could we launch this new line of Disney comics than to bring back the very people who did such a wonderful job, in my opinion, previous to this. One can only look at that stack of prestige format Walt Disney's Comics and Stories and Uncle Scrooge and say, "Wow, they did a beautiful job on the covers, the art, the interiors!" And my intention is, when you take my first issue and stack it on top of their last issue, albeit three years removed, they will fit like a glove. BB: Let's say that there's a, retailer who might be out there right now who still isn't convinced that they should take a chance on the new Gemstone Disney books. What might you say to that retailer to change his or her mind? SG: Well, that's always the $64,000 question, and I guess if I had the answer to that every publisher would be ringing my phone everyday since we're their distributor, but we'll probably come up with some programs at some point, once we get rolling, that might be experimental in nature. Where we have a little more risk free opportunity for them to try the books out. I don't think we'll do that out of the gate. I think we'll see where we stand first. But there are certainly opportunities that we've done through Diamond -- overship programs, things of that nature -- to give people a chance who've said, "Prove it to me!" Ultimately, you have to be a good retailer, yourself, because just putting them in your store doesn't necessarily make anything sell. You have to rack them properly. You have to service them properly. You have to proselytize to your customers that you have them, because you could have a hundred copies of every title on the shelf, but if no one knows that you carry Disney comics, and they're buried at the back of the store, they might not come in looking for them. So we're going to try to work in tandem with the retailers to try to do things that will promote and advertise the Disney brand. And quite frankly, I'm hopeful that as we develop our relationship with Disney -- which has been excellent so far, even before the first publication -- my hope is that we can leverage some of the power and the sway of the great Disney name, and all their connections, not the least of which is all the great parks that they own, to really make this launch a wildly and hugely successful one. Call me the eternal optimist, but I wouldn't be doing this if I didn't think that it had really tremendous potential. I absolutely believe that. BB: What about the individual consumer? Why should they pick these books up, given that a lot of them haven't had any real experience with Disney comics? SG: Well, I can give you personal reasons for that. No better endorsement to say -- even though it may sound self-serving, because I'm the publisher -- but there's no better endorsement for anything, whether it's food or a movie, than to say, "I did it myself. I read them myself. I love them. My kids read them." Ask your friends. You'll find that's the best endorsement of anything, when you can give a first person testimonial to something that you actually enjoy and do. We're going to promise great stories, and certainly we already know they exist. The 6,000 some pages that Carl Barks generated over his wonderful career alone proves that fact. We're going to continue the modern day "Barks era" of these various and sundry talented artists and writers that we've all come to know and love. And we're going to give value for your dollar. In any entertainment choice that you have, if somebody says, "I'm going to give you a good value for the money you spend. I'm going to give you good quality product, and good promotion, and entertainment," I think you'll get a chance. Consumers are the ultimate barometer of your success or failure, but I think I'll bet on these Disney comics on any day of the week. They've got an illustrious history of 75 years of entertaining people to the point where we have theme parks about these characters -- which is hard for anybody to do, sustain a theme park based on characters. There have been very few successes in that area. Disney's certainly the quintessential one.